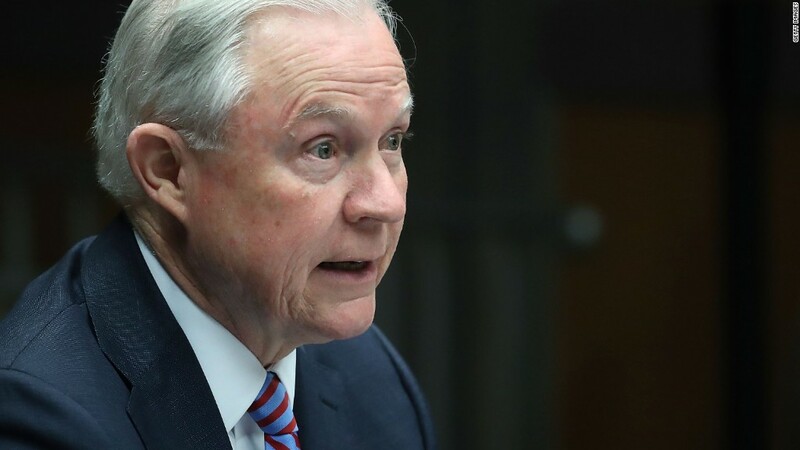 Attorney General Jeff Sessions on Thursday rescinded Obama-era protections for marijuana businesses and cast a dark cloud over a booming industry. The news sent marijuana-related stocks tumbling, and had some wondering what might happen to an industry that took in $8 billion in sales last year and is expected to grow to $23 billion nationally by 2020 and create more than 280,000 jobs. "I think we're certainly going to see a chill to the growth rate of this nascent industry," said Justin Strekal, political director for the pro-legalization group NORML. But it's hard to say exactly how Sessions could impact a popular industry that's used to risk and itching to fight back against the Trump administration. Chris Walsh, vice president and analyst for the industry publication Marijuana Business Daily, compared the Sessions move to a "stink bomb." "We'll just see what the fallout is, but I don't think it's going to be a significant impact beyond a chilling effect," said Walsh. "You're not going to dismantle this industry. It's too late for that. You're not going to put that genie back in the bottle." The White House on Thursday characterized the move as simply enforcing existing laws, which prohibits marijuana, but didn't elaborate. "The president believes in enforcing federal law. That would be his top priority, and that is regardless of what the topic is," White House spokeswoman Sarah Sanders said. "[Sessions' move] simply gives prosecutors the tools to take on large-scale distributors and enforce federal law." William Simpson, CEO of Golden Leaf, a company with seven dispensaries in Oregon, and also three farms in Oregon, Nevada and Canada, said he has no plans to halt expansion because of the announcement. Simpson said he currently employs 127 people and plans to add up to a 100 more this year, and plans to add more farms and dispensaries. "We are pushing full force forward," he said. California, where dispensaries started selling retail marijuana on January 1, Oregon and Nevada are among the eight states where recreational marijuana is legal. It is also legal in Washington, D.C. Canada is planning to legalize recreational marijuana this year. Phil Goldberg, CEO of Green Leaf Medical LLC in Frederick, Maryland, said that he feels insulated from any potential crackdown because he only deals in medical, not recreational, marijuana. Twenty nine U.S. states allow for medical marijuana. Goldberg said he's more concerned about how Sessions might impact banking. He said Green Leaf does business with a local bank unlike some dispensaries out west, which deal exclusively in cash because of federal laws prohibiting banking activity with cannabis businesses. Cannabis banking is a bit of a conundrum. Sessions on Thursday rescinded what's called the Cole memo, issued in 2013 by then-Deputy Attorney General Jim Cole. It guided federal prosecutors to take a hands-off approach to marijuana businesses in states where it's legal, as long as their businesses didn't impede on federal priorities like keeping drugs from children or limiting trafficking by cartels. Based on the Cole memo, the Obama administration issued guidance to banks on how to provide finance services to state-legal cannabis businesses, while at the same time acknowledging that marijuana is illegal according to federal law. It basically told financial institutions to take state laws into consideration. But this move could impact a small amount of progress made by marijuana businesses in accessing financial services. Goldberg said he'd rather not have to conduct business in cash, especially paying taxes. "I hate to go down and pay my taxes in cash," he said. "That seems silly, but that's what was happening in Colorado." Nicole Donegan, a spokeswoman for Severn Bank in Annapolis, told CNNMoney that "we are providing banking services to state licensed medical cannabis companies in Maryland." She also said, "If a formal announcement is made about rescission of the Cole memo we will evaluate at that time." Giadha Aguirre De Carcer, CEO of New Frontier Data, said the Sessions announcement "is unlikely to be massively disruptive to cannabis businesses that are already in operation." "Consumers are not going to stop buying cannabis in legal states, and businesses are not going to start laying off people or closing their doors just because of this announcement," she said. She also said it's "too early to tell" whether the Department of Justice will enforce federal law in legal states.